A Winter Storm Is Pummeling The Rockies, And The Plains Are Next : The Two-Way The powerful winter storm has prompted avalanche warnings in Utah, and blizzard watches in the Plains states. Travelers are advised to watch for airline delays. Current winter storm watches and warnings from the National Weather Service. It's the first major winter storm of the year, according to the National Weather Service, and it's pounding Utah and Colorado. The service says a weather system that initially blew in from the Pacific is dumping many inches of snow in the Rocky Mountains. Glen Haven, a town north of Denver right on the Rockies foothills, has gotten nearly a foot, according to the Denver Post. In Utah, the state's Avalanche Center issued a warning for dangerous backcountry snow slides, says the Salt Lake Tribune. "Heavy snow will begin falling in the central Plains by Wednesday evening and move into the Upper Midwest overnight and during the day on Thursday. The heaviest amounts will be across Iowa and into southern Wisconsin, where up to a foot of snow is possible. Strong, gusty winds accompanying the storm will bring blizzard conditions, making travel in the area hazardous." "Some of these warnings are Blizzard Warnings due to the possibility of wind gusts in excess of 50 mph that will blow around any newly-fallen snow. A foot of snow is possible for the Central Plains, while well over a foot of snow is possible for Iowa and Wisconsin Wednesday through midday Thursday. 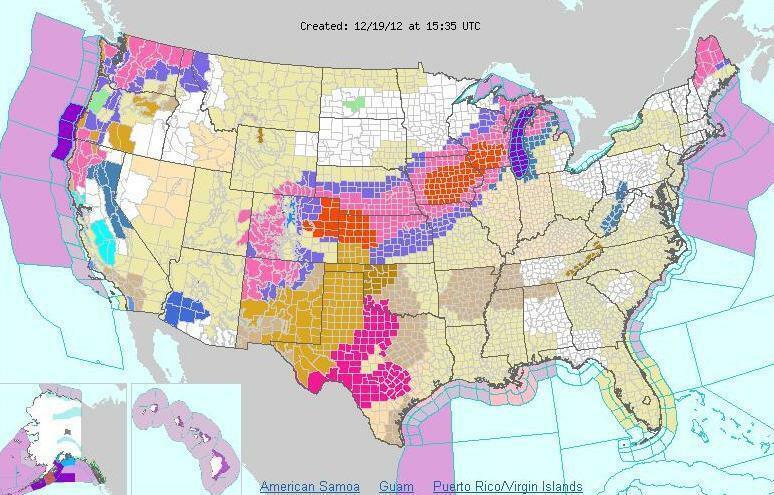 It is likely that the Winter Storm Warnings in Wisconsin will be converted to Blizzard Warnings for Thursday." The National Weather Service says the storm will push on to Michigan by Friday morning. Watch out for air travel delays - USA Today reports some flights could be postponed at big hubs like Chicago's O'Hare airport because of poor visibility and high winds, not just snow.